Dare was good! We spent the first day exhibiting, the second day mostly milling around the excellent show, looking at everyone else’s games. It was impossible not to! 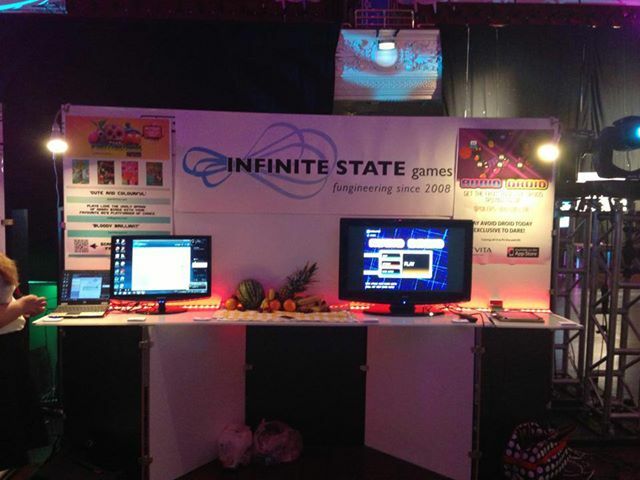 It was fantastic to watch people play both our games. We must have had over 100 people play our games over the course of the weekend so as you can imagine we’ve learned lots. That’s about the best quality assurance you can get really, watching complete strangers play your game. Open for BUSINESS! Here’s our stand. We were given lots of compliments about our display of fruits. That was nice. Everyone likes fruits! People liked the posters we had made, too. Our logo looked great too, so big shout out to the Weston-super-Mare Staples crew. NIce work! As a crowds started to form, our secret weapon ‘Ritchie’ made an excellent ring master. Every company needs a Ritchie. He’s our man who gets stuff done at ISG, be it PR, QA, security or general hook ups. If we need something sorted, we go to Ritchie. We also found that Avoid Droid is a great game to watch. People really crowded round the big scree watching the game in progress. Lots of ‘Oooh!’ and ‘OOooof!’ when people pulled off some dicey dodging. This bodes very well for the YouTube replay sharing facility we’re planning on implementing! People were really fond of Avoid Droid. We found the ladies were generally playing the game very differently from the blokes; much steadier hand and much more graceful movements. It was fascinating to see the scope of different ways people automatically play the game, and this has given us lots of ideas for enhancing the unexpected ‘waltzy’ feel of some areas. The surprise of the event was how much everyone ADORED Chill Out Mode! And here we are in the programme for the event! A good time had by all. Thanks Dare, and thanks Dundee. Here’s a quick video of the weekend. Sorry about the low-def quality, but you’ll get a feel of what it was like to be there. As for the other games there, we’re not just saying this but we thought every single one was amazing in it’s own way. Particular shout outs to Firebrand Games’s ‘Solar Flux HD’ which we thought looked really cool and had amazing audio, and also one of the student Protoplay games where there were three agents escaping a bad guy’s lair – with a fourth player setting off traps using a tablet computer linked to the game. That agents escaping game was fantastic, totally inventive and our pick of the best game there (apart from ours, of course). If only we could remember the name of that game! If someone knows, please drop us a line! Fingers crossed for a release one day for Wii-U for that. Previous postISG at DARE: The Details! Next postISG guest post on the PlayStation Blog!